Even after formatting, the data resides on your computer, which can be easily recovered using a data recovery software. Any sensitive data such as your bank account number, passwords, and ATM pins that you have stored, can be recovered and misused. Here, for File comes to your aid by deleting your data completely through its powerful and advanced deletion algorithms. 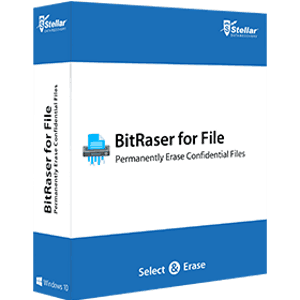 BitRaser for File is A powerful software that will protect all your data from falling into wrong hands, BitRaser for File permanently erases data from a rage of data storage devices beyond the scope of recovery. When you plan to dispose off your computer, laptop or any other storage device, or donate it or sell it, this application is extremely useful to avert misuse of information that are still present on the hard drive of your system. 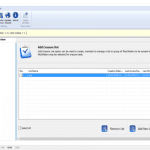 This software can erase selected Volumes, Files and Folders beyond the scope of recovery. If you want to delete a full volume, all you need to do is select it. You can also click on the nodes [+] to expand and navigate deeper to visit the required files or folders. When you browse the Internet, all your activities are being recorded and stored, which puts your privacy at risk. Through the cookies, history, favorites, temporary Internet files and lots more, anyone can procure sensitive and confidential information, which is highly unsafe. This software, helps in erasing all the Internet activities, therefore, keeping your privacy intact. It supports Internet Explorer, Edge, Firefox, Chrome, Safari, Sea Monkey, Opera, and Netscape Navigator web browsers. With this software, you can easily erase application traces from applications like Email and News, Peer to Peer, Microsoft applications, Chat Messengers, and other supported applications. 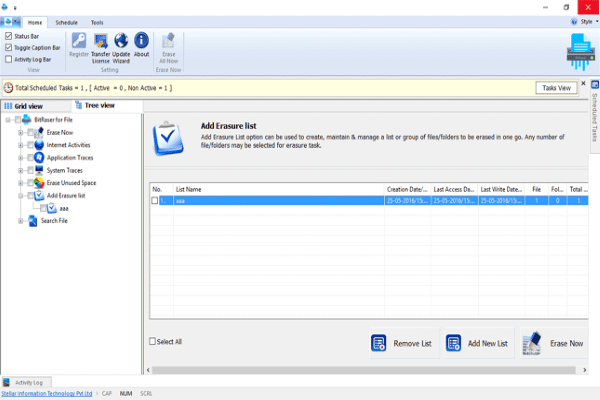 Application groups can be selected to use the feature. Even after you have successfully deleted the data from your system, system traces will still remain. These files are created by the operating system while running a process. Additionally, these files occupy a lot of memory space that slows down the system and hampers the proper working of the Operating system. This software deletes the system traces, therefore enhancing the speed, performance, and memory space of your computer. It can also delete the Unused space created due to deletion of files or folders in the storage device so as to secure privacy and optimize the use of memory, no matter whether the file system is File Allocation Table (FAT), exFAT, or New Technology File System (NTFS). It supports Windows 10, 8.1, 8, 7, Vista, XP, Windows server 2003, 2008 and 2012. Its user friendly and improved graphical user interface comprises characteristics with the help of which you can erase data completely and make them unrecoverable. However, before installing the software, ensure that your Windows computer meets the minimum system requirements. You can download the demo version of BitRaser for File to understand it’s working. And, once satisfied, you can purchase it online. BitRaser for File is A powerful software that will protect all your data from falling into wrong hands.